Detailed review of Vichy Liftactiv Serum. See what real experts and actual users have to say about this face serum. There’s a lot to love when it comes to Vichy Liftactiv Serum. With a super fast dry time and a texture that leaves your skin feeling extremely soft, Vichy Liftactiv is genuinely a serum that’s both easy and enjoyable to use. With promises of delivering anti-aging benefits in 10 specific areas of aging concerns, Vichy Liftactiv delivers on its promise to decrease fine lines and wrinkles in problem areas on your face. However, when it comes to firming and lifting the skin, as well as other areas of aging, it sadly falls short. The length of time it takes to see minimal results means this face serum simply isn’t worth the money, even if it does have some really wonderful application aspects about it! This is one you can probably skip unless fine lines and wrinkles are your only aging concern. Vichy Liftactiv Serum has a texture very similar to your average face serum. However, when you apply it to your face and neck, it definitely feels more like a moisturizer than it does a serum, which I really enjoyed. Once the serum had absorbed, I found that it made my skin feel so soft! There wasn’t a sticky or slick residue left behind; you could definitely feel that you had a layer of product on your face, but when I touched my face, it was extremely soft and smooth feeling. I haven’t experienced this much with a serum before, and I absolutely loved it! I really don’t like the packaging for Vichy Liftactiv Serum because it makes it more difficult to apply. It has a weird dropper-like applicator, but you don’t squeeze at the top. Instead, you push this button down and it’s supposed to fill the dropper up with the serum. The dropper didn’t ever fill fully when I pushed down on the button, and I really think you need an entire dropper full of product to cover your face and your neck, so I had to dip back in for a bit more. It isn’t necessarily hard to use, but it’s definitely more annoying. Once you get passed the packaging, however, application is super simple. Apply a small amount of the face serum morning and night to clean, dry skin. Since I always use a toner, I made sure to use that before, too. Once Vichy Liftactiv Serum had absorbed, I used my moisturizer and other skincare products on top. The serum was super easy to layer products on top of, as well. Vichy LiftActiv Serum had such a quick dry time! Within 15-20 seconds of applying the serum, it was completely absorbed and had left that really soft feeling behind on my skin. I love a quick dry time because it makes it that much easier to incorporate into my daily skincare routine. Vichy LiftActiv Serum is totally odorless. I have a really good nose, and I try super hard to detect any sort of odor a serum has, but this definitely doesn’t smell like anything! 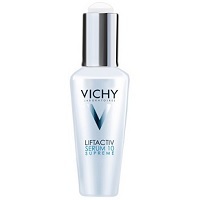 As I do with every new face serum I try, I used Vichy Liftactiv Serum at night first. Since the product says you see visible results in 10 days of use, I sort of assumed I would see immediate results. Unfortunately, that wasn’t the case. There definitely weren’t any negative side effects when I woke up the next morning, but I didn’t see any positive changes in my skin either. I definitely experienced visible results with Vichy Liftactiv Serum, but it took longer than the 10 days promised. The biggest result I experienced was a decrease in my fine lines and wrinkles. I actually think it did a really nice job at that, specifically around my eyes and my smile lines. Vichy said this serum would visibly firm and lift your skin, as well, but sadly, I didn’t experience that. While the serum may set out to target 10 signs of aging, I really only think it made a difference as far as wrinkles are concerned. Don’t get me wrong, that’s awesome! It just doesn’t deliver on as many anti-aging benefits as promised. While I liked that my fine lines and wrinkles were less visible after using Vichy Liftactiv Serum, I don’t know if this serum is actually worth the money. At $45.00, it’s not the most expensive serum on the market, but there are definitely more affordable options, as well. Based on the length of time it took to see results and the fact that it really only targeted one aspect of anti-aging, I don’t think it’s worth the money. I also have used plenty of other anti-aging face serums that delivered better results in a shorter period of time and at a cheaper price point. Vichy offers a 30-day money back guarantee, however, empty products cannot be returned. To purchase Vichy Liftactiv Serum, click here.